Panzerkampfwagen IV ausf B (Sdkfz 182) with turret designed by Krupp for the Tigger II designed by Professor Doctor Ferdinand Porsche (September 3, 1875 – January 30, 1951). This Tiger II of Schwere Panzer Abteilung 503, was abandoned by Leutnant Rambow's crew during the Normandy Campaign. Rambow was leading two Tigers through Beauvais when one threw a track on the Rue Antoine Caron. The crew of the other Tiger started repairs when the British 4th/7th Royal Dragoon Guards of the 8th Armoured Brigade entered the town and fired on the disabled Tiger. The crew fled and made it back to German lines. Leutnant Rambow fought the British to Amiens, where he ran out of fuel and ammunition. His crew set fire to the vehicle, causing the suspension to settle. Note missing outer road wheels. In 1941, Doctor Porsche was contracted, along with Henschel und Sohn, to design the Tiger II tank. Porsche's design used more copper wiring, which led to the adoption of the Henschel design as the production Tiger II on November 11, 1942. Porsche was so sure that his design would be accepted he had ordered Krupp to begin production of their turret for his design; fifty were completed when the contract was canceled. Henschel began designing the new Tiger II, but to move the project along, the Porsche turrets were fitted to the new Henschel design. These tanks were issued first to Schwere Panzer Abteilung 503. Twelve Porscheturm (Porsche Turret) Tiger IIs and two Henshelturm (Henschel Turret) Tiger IIs were issued between May 1944 and June 1944, when Panzer Abteilung 503 left for Normandy. The Porscheturm Tiger IIs had a stronger turret because of the curved surface deflecting anti-tank rounds, but a shot trap caused rounds that hit under the curved gun mantlet were deflected into the driver's compartment, killing the driver and the radio operator. However, most Tiger IIs were not lost to Allied tanks; artillery and fighter-bombers were the chief combat losses of Tiger IIs. More than that, the Tiger II suffered from poor road performance and its heavy weight caused French and Belgian bridges to collapse. More Tiger IIs were lost to mechanical breakdown than in combat. 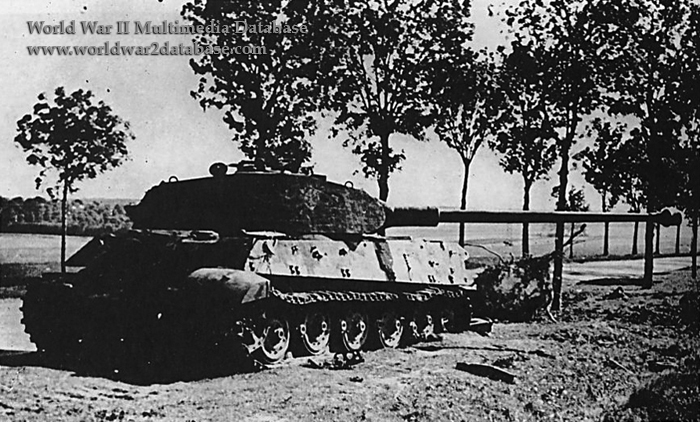 Of the twenty-six Tiger IIs Panzer Abteilung 503 was issued during the Normandy Campaign, only two survived. Tigers of Kampfgruppe Lammerding, 2nd SS Panzergrenadier Division "Das Reich"